Lake Laura is a 44-acre impoundment located in southwestern Shenandoah County near the West Virginia state line. The lake is owned by Bryce Mountain Resort and the Department of Game and Inland Fisheries began managing the fishery in 1991. The dam impounds the headwaters of Big Stony Creek creating a rectangular-shaped pool with a maximum depth of thirty feet. Lake Laura had a history of nuisance algal blooms and over-abundant aquatic vegetation. To remedy this situation, Bryce Mountain Resort dredged the upper end of the impoundment removing nutrient laden sediment and increasing water depth thus limiting conditions for vegetation growth. Triploid grass carp have also been stocked to keep aquatic vegetation at desired levels. Anglers have the opportunity to fish for largemouth bass, bluegill, pumpkinseed sunfish, crappie, walleye, channel catfish, and northern pike. Lake Laura has one of the highest density largemouth bass populations found anywhere in Virginia. The majority of the bass were less than 12 inches in length, but there has been an increase in the number of larger fish in recent years. Largemouth bass reproduction has been consistent therefore the population should remain stable. High densities of bass can lead to slow growth rates and a “stunted” population. Therefore, anglers are encouraged to harvest bass less than 12 inches to reduce the potential of a overcrowded population. By harvesting small bass anglers can help increase bass growth rates thus increasing the number of quality-size fish in the population. The sunfish population in Lake Laura is comprised of bluegill and pumpkinseed sunfish. Bluegill outnumber pumpkinseed by about 10:1. In most cases, when a lake has a very dense largemouth bass population the sunfish fishery is comprised of larger individuals. High numbers of predators (bass) control the number of sunfish thus increasing growth rates of sunfish. 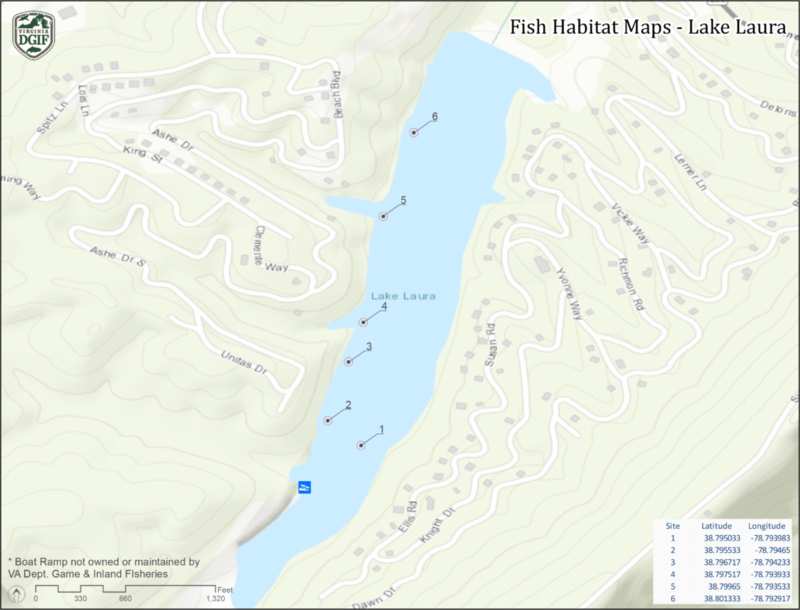 Lake Laura exhibits a quality sunfish fishery with good numbers of fish > 6 inches. The excessive aquatic vegetation that has plagued the lake in the past created to many hiding places for small sunfish. Predators could not effectively control the numbers of sunfish and they were slightly stunted. Recent vegetation reduction has allowed predators to better control sunfish numbers resulting in more quality-size fish. Lake Laura has a modest crappie population. Only small numbers of crappie have been sampled by biologists during electrofishing and netting surveys since the Department began managing the fishery. The average size of the crappie was 9 inches. Anglers should target woody structure like downed trees and beaver lodges when looking for crappie. Lake Laura exhibits a quality catfish fishery. Natural Reproduction of catfish is limited and to maintain a fishery the Department stocks fingerlings annually. Catfish up to 27 inches have been sampled by biologists in recent years. The Department is considering stocking larger catfish to increase survival. Historically some northern pike were stocked in Lake Laura by an unknown source. In 1997 the Department began annual stockings of northern pike fingerlings. Pike are stocked to control sunfish numbers and to provide angling diversity. Daily Creel Limits: 5 per day, only one can be greater then 15 inches in length. There is no minimum size limit for sunfish. Anglers can keep 50 sunfish per day. There is no minimum size limit for crappie. Anglers can keep 25 crappie per day. There is no minimum size limit for channel catfish. Anglers can harvest 20 catfish per day. There is a 20 inch minimum size regulation for northern pike. All northern pike less than 20 inches must be released. Anglers can harvest two northern pike per day. A primitive boat launch is located at the upper end of the lake. There is shoreline fishing access across the breast of the dam and around the boat launch area. The remainder of the shoreline is owned by private homeowners and is not open to the public. Parking areas are located immediately below the dam and at the boat launch.